Eating Disorders are the most common health problems of our time, and they create tremendous suffering. There is nothing pleasurable about Eating Disorders. Eating Disorder can rob you of self-confidence, productivity, your faith and peace of mind. It can also create conflicts in relationships with other people. With Eating Disorder, you will feel at times that everything around you is falling apart, anxiety over food, eating and being with other people will settle in and this often leads to thinking that there is no way out of hopelessness and helplessness. According to Caroline Carr “If someone becomes overwhelmed by anxiety, they could have a panic attack. This is an absolutely terrifying experience- people describe feeling as if they are having a heart attack.”** But there are things you can do to help yourself, such as relaxation exercises etc. Every time you feel anxious or on edge or the whispers of the demon are getting stronger, take some time out and try these two relaxation exercises. Inshallah, you will see the benefits for yourself. Try to use these exercises as much as you can during the month of Ramadan. “A good exercise is to pay attention to your breathing. Breathing from the stomach kills two birds with one stone. First, the tension caused by worry will be reduced. Second, concentrating on breathing will distract you. A good exercise to relax you is to pay attention to your breathing. This following exercise will teach you to relax by making better use of your breathing. Go and sit or lie as comfortably as possible in a comfy chair or on the sofa. Place one or two hands on your stomach. You can also close your eyes if you like. Breathe in deeply through your nose. Try to feel the movement of your stomach. Don’t hold your breath, just breathe out quietly. After a few minutes of trying out the above exercise, I then play this Tarikat- Breath Meditation La Ilaha Ilallah on my Phone. I relax and match my breathing to ‘La ilaha Illalah’, after I’ve completed this exercise, Alhamdulilah. See the benefits for yourself. In this video name of Allah is said with the breath. According to the author this track is the most difficult to sing. So listen with heart as the rhythmic pattern of breath and recitation of Allah’s name is taken. One small Exercise- Breathe deeply and smile. Take a moment to breathe in deeply, right into your abdomen. (If your shoulders go up, you are only breathing into the top part of your lungs, so you want to take a good deep breath). As you breathe out, lift your body upright and really smile. Say to yourself mentally or out loud: I’m OK, I can cope with this, Allah is with me.’ And believe it. Now Close your Eyes and repeat ‘Ya Shaffee (Sha-fee) ‘The Healer’ as many times as you like in your heart. yâ shâfî anta ash-shâfî is a powerful wazîfa which can be translated as O Healer, Thou art The Healer. Do this whenever you can- do it often enough and it will become automatic. It will lift your energy, your spirit and will clear your mind. 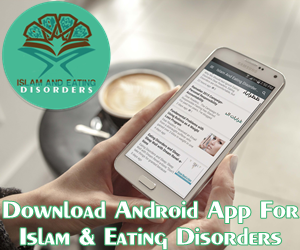 Living a life free from Eating Disorder may seem impossible, especially if you’ve been living with this for years, but I’m convinced that you can defeat this demon of Eating Disorder by right treatment, belief in Allah and a little courage. I have panic attacks myself and they are horrifying. The first one I had I ended up in the hospital because I was so sure I was dying. I was only 17. Breathing is an amazing way to release oxytocin. This is known as the love hormone because it makes us feel good. Hugs also releases this. So if you are nervous or having anxiety, hug someone.